Undifferentiated pleomorphic sarcoma (UPS), previously called malignant fibrous histiocytoma (MFH), is a soft tissue sarcoma (STS) that can occur anywhere in the body, but it usually occurs in the extremities (especially the thighs) or back of the abdomen (see the image below). Approximately 15% of undifferentiated pleomorphic sarcomas arise in the abdomen and pelvis. UPS often grows quickly and spreads to other parts of the body, including the lungs. 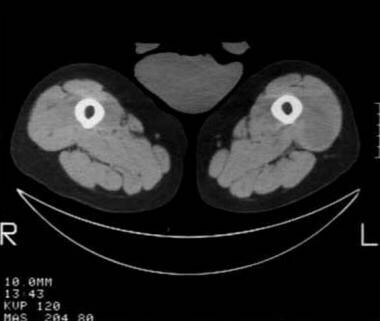 CT reveals a mass within the anterior compartment musculature of the left thigh. The malignant fibrous histiocytoma is only slightly hypodense to muscle and conceivably could be overlooked. Historically, the term malignant fibrous histiocytoma (MFH) was applied to pleomorphic spindle cell neoplasms with fibroblastic and histiocytic differentiation. However, the majority of tumors within this classification did not show any evidence of histiocytotic differentiation, and many were found to be other types of poorly differentiated tumors. The small minority of tumors for which the term MFH was most representative are now classified as undifferentiated high-grade pleomorphic sarcoma. Rare signs and symptoms include episodic hypoglycemia and rapid tumor enlargement during pregnancy. Additionally, UPS has been associated with hematopoietic diseases such as non-Hodgkin lymphoma, Hodgkin lymphoma, multiple myeloma, and malignant histiocytosis. Retroperitoneal tumors may present with constitutional symptoms, including fever, malaise, and weight loss. The tumor is often large at presentation and may cause displacement of the bowel, kidney, ureter, and/or bladder. UPS may also occur secondary to radiation exposure and shrapnel injury and may be seen adjacent to metallic fixation devices, including total joint prostheses. Early and complete surgical removal using wide or radical resection is indicated because of the aggressive nature of the tumor. Provide adequate imaging of primary tumor for all lesions with a reasonable chance of being malignant. Imaging studies should include cross-sectional imaging magnetic resonance imaging (MRI) with and without contrast to provide details about the size and contiguity to nearby visceral structures and neurovascular landmarks. 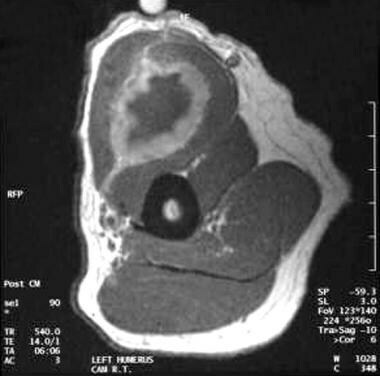 The addition of computed tomography (CT) scanning with contrast may be needed. Other studies such as angiography and plain radiography may be warranted in individual situations. PET/CT scan may be useful in staging, prognostication, and grading. For retroperitoneal/intra-abdominal STS, a chest/abdominal/pelvic CT scan is recommended, with or without an abdominal/pelvic MRI. MRI and core needle biopsy are recommended prior to definitive surgery. Imaging of the thorax by CT scan for lung metastases should be done before radical treatment; further staging may be considered depending on subtype and location of the sarcoma. 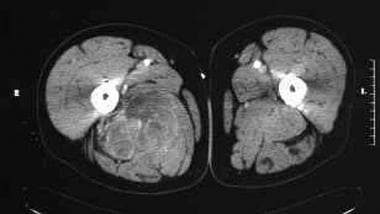 CT of the chest, abdomen, and pelvis with intravenous contrast is the preferred imaging modality. MRI may be a useful ancillary modality in selected cases to define extent of adjacent organ/structure involvement that is not clear on CT but is not required in most cases. MRI is an option for patients with contrast allergy, for pelvic tumors, or for cases in which detailed anatomic information (eg, sciatic foramen) is required. 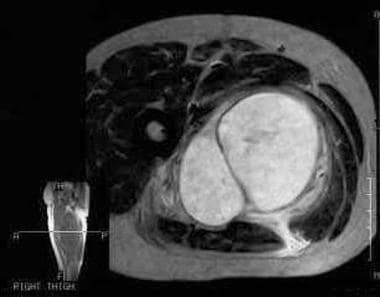 The initial imaging study for a superficial or palpable soft-tissue mass should be radiographs. US is equally appropriate for small lesions that are superficial to the deep fascia. For deep masses or lesions in areas difficult to evaluate radiographically (ie, groin, paraspinal area, deep soft tissues of the hands and feet, or flank), radiographs are also usually appropriate. If the initial evaluation of soft-tissue masses is nondiagnostic, further evaluation with MRI without and/or with IV contrast is usually appropriate. In patients presenting with spontaneous hemorrhage or suspicion of a vascular mass, if the initial evaluation is nondiagnostic, further evaluation with either MRI without and with IV contrast or CT without and with IV contrast is usually appropriate. If the initial evaluation of a soft-tissue mass is nondiagnostic in patients who are non–MRI compatible or who have metal limiting MRI evaluation, CT with IV contrast or CT without and with IV contrast is usually appropriate as the next imaging study. For a full summary of guidelines recommendations, see Soft Tissue Sarcoma Guidelines. Noninfused T1-weighted MRI reveals a low signal intensity mass posterior to the femoral diaphysis (same patient as in the previous image). T1-weighted MRI obtained following intravenous gadolinium administration reveals inhomogeneous enhancement of the soft tissue mass (same patient as in the previous image). No single imaging technique can provide a specific histologic diagnosis of pleomorphic sarcoma, and biopsy is usually necessary. If the radiologist is asked to perform a biopsy on a potentially malignant soft-tissue mass, the orthopedic surgeon resecting the mass must be consulted first. With certain tumors, the biopsy tract must be removed with the mass; a presurgical image-guided biopsy performed without appropriate orthopedic consultation may result in more extensive surgery (including amputation) than would have been necessary otherwise. 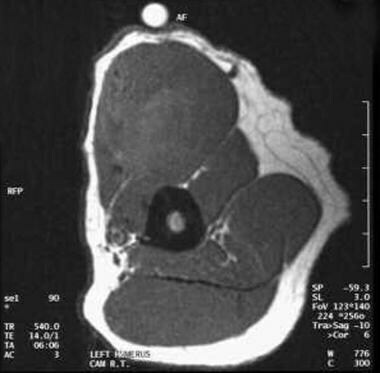 Radiographs may reveal a nonspecific soft-tissue mass (see the image below), often greater than 5 cm in diameter. 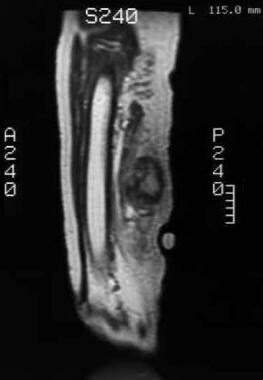 Deep intramuscular tumors often lie adjacent to the diaphysis of a long bone. Radiograph demonstrates a soft tissue mass posterior to the femoral diaphysis. 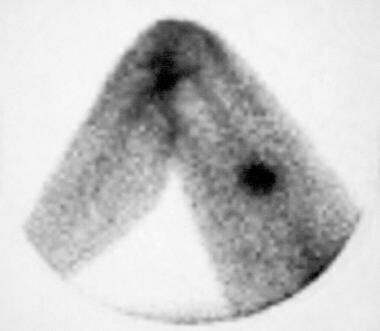 Although not appreciated on the radiograph, a component of the mass extends inferiorly and contains a small cluster of calcifications (within circle). Secondary osseous involvement, including periosteal reaction, cortical erosion, and pathologic fracture, is uncommon but suggestive of a malignant soft-tissue sarcoma. Calcification or ossification can be detected in 5-20% of patients. Calcifications within the tumor may be punctate, curvilinear, and/or poorly defined. Heterotopic bone formation may be present in the periphery of the mass. Transverse CT image following enhancement with intravenous contrast shows a heterogeneous and mildly enhancing soft tissue mass in the posteromedial right thigh. 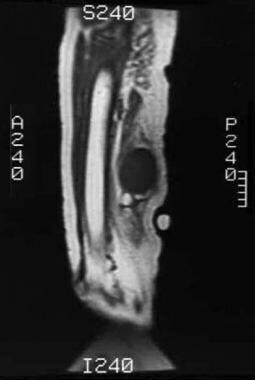 T2-weighted MRI reveals a hyperintense mass within the posteromedial right thigh (same patient as in the previous image). The mass proved to be a malignant fibrous histiocytoma. T2-weighted MRI demonstrates the tumor much more conspicuously. Regions of prominent fibrous tissue (high collagen content) may demonstrate low signal intensity on both T1-weighted and T2-weighted images. Calcification may present as foci of low signal on both T1-weighted and T2-weighted sequences. Subacute hemorrhage should be considered when regions of high signal are noted on both T1-weighted and T2-weighted images. 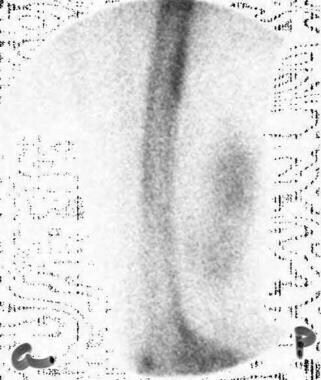 Areas of necrosis demonstrate a signal pattern similar to that of fluid. As with CT, solid components of MFH typically reveal nodular and peripheral enhancement. Tumor margins appear relatively well defined on MRI; a low signal intensity margin may be observed, representing a pseudocapsule. 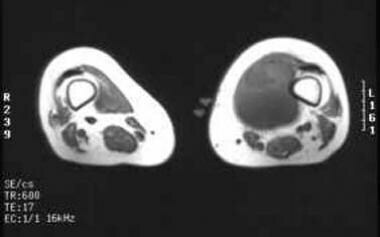 Preinfusion T1-weighted MRI reveals a large mass. 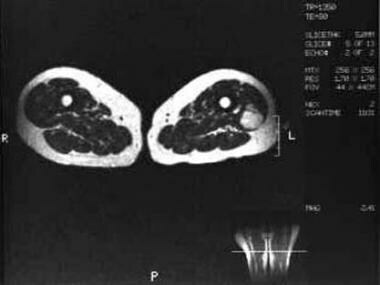 Although slightly heterogeneous, the tumor is predominantly isointense to muscle. T1-weighted MRI obtained following intravenous administration of gadolinium reveals circumferential enhancement of the tumor (same patient as in the previous image). T2-weighted MRI reveals heterogeneous signal of the malignant fibrous histiocytoma (same patient as in the previous image). Central low signal intensity may be the result of old blood products. T2-weighted MRI obtained following gadolinium administration reveals heterogeneous enhancement of the malignant fibrous histiocytoma. Preinfusion T1-weighted MRI of a patient with a medial left thigh mass proven at biopsy to represent a malignant fibrous histiocytoma. 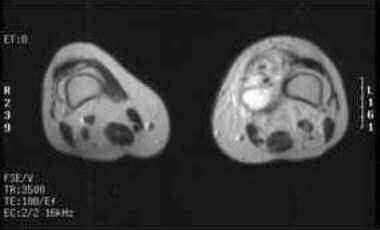 Although slightly heterogeneous, the mass is predominantly isointense to muscle. Malignant fibrous histiocytoma. T2-weighted MRI reveals predominantly increased signal intensity in the tumor mass (same patient as in the previous image). The radiologist should keep in mind that the diagnosis of UPS is made using histopathology, not imaging; however, MRI remains invaluable for delineating tumor extent. 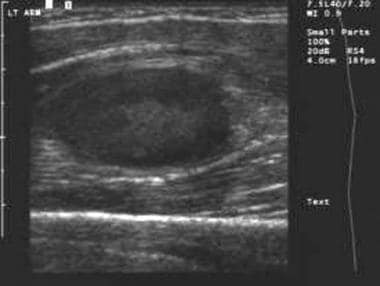 Ultrasound image demonstrates a predominantly hypoechoic mass in the thigh representing a malignant fibrous histiocytoma. Regions of hyperechogenicity likely correspond to cellular components of the tumor. 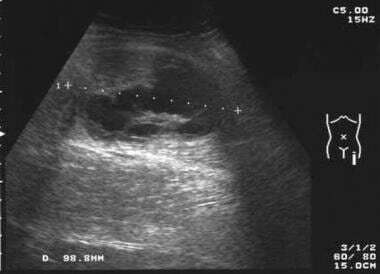 Ultrasound image demonstrates another example of a predominantly hypoechoic mass within the patient's thigh, proven to be a malignant fibrous histiocytoma. 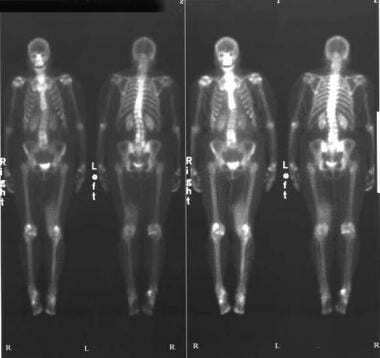 Technetium-99m bone scintigraphy often shows increased uptake by tumor, regardless of the presence of calcium within the tumor or invasion of adjacent bone. Hypervascular lesions show increased radionuclide uptake on both dynamic and blood pool images. The mildly increased uptake observed on static images is also probably related to hypervascularity and may be more prominent with internal calcification. Bone scans usually are not ordered to evaluate the primary tumor but may be obtained if osseous metastases are suggested. Gallium-67 scans may also demonstrate increased activity. 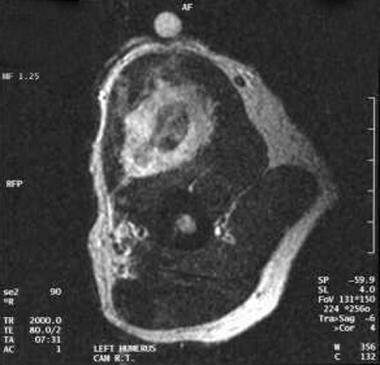 Spot image of a technetium-99m bone scintigram (delayed phase) reveals increased radiotracer uptake in the soft tissue tumor. Gallium-67 scintigram reveals increased radiotracer activity in the left thigh. 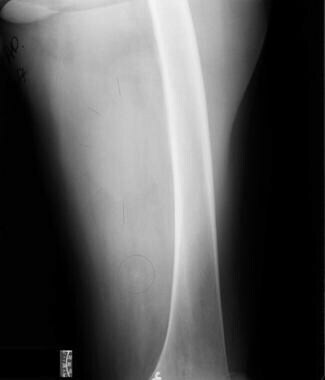 Technetium-99m bone scintigram (delayed phase) reveals increased radiotracer uptake in the left thigh. 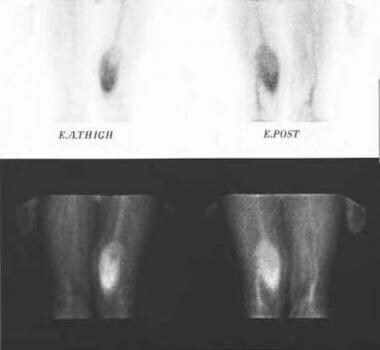 Spot images from technetium-99m scintigram (blood pool phase) reveal increased radiotracer uptake in the left thigh. Angiographic findings are nonspecific. The tumor may be hypovascular or, more commonly, hypervascular with early venous return (see the image below). Similarly, retroperitoneal tumors may be either hypovascular or hypervascular, with blood supply from the lumbar, celiac, iliac, renal, renal capsular, and/or inferior adrenal arteries. 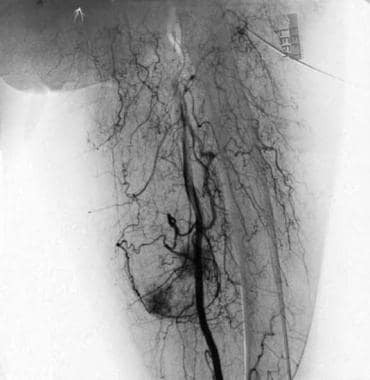 Angiogram reveals tumor hypervascularity (same patient as in the previous image). What is pleomorphic sarcoma (malignant fibrous histiocytoma) of soft tissue? What is the WHO classification of pleomorphic sarcoma (malignant fibrous histiocytoma) of soft tissue? Where in the body do pleomorphic sarcoma (malignant fibrous histiocytoma) of soft tissue occur? What are the signs and symptoms of pleomorphic sarcoma (malignant fibrous histiocytoma) of soft tissue? What are the NCCN imaging guidelines for pleomorphic sarcoma (malignant fibrous histiocytoma) of soft tissue? What are the UK imaging guidelines for pleomorphic sarcoma (malignant fibrous histiocytoma) of soft tissue? What are the Trans-Atlantic Retroperitoneal Sarcoma Working Group imaging guidelines for pleomorphic sarcoma (malignant fibrous histiocytoma) of soft tissue? What are the ACR Appropriateness Criteria for imaging of pleomorphic sarcoma (malignant fibrous histiocytoma) of soft tissue? What is the role of imaging in the workup of pleomorphic sarcoma (malignant fibrous histiocytoma) of soft tissue? What is the role of radiography in the workup of pleomorphic sarcoma (malignant fibrous histiocytoma) of soft tissue? What is the role of CT in the workup of pleomorphic sarcoma (malignant fibrous histiocytoma) of soft tissue? What is the role of MRI in the workup of pleomorphic sarcoma (malignant fibrous histiocytoma) of soft tissue? What is the role of ultrasonography in the workup of pleomorphic sarcoma (malignant fibrous histiocytoma) of soft tissue? What is the role of nuclear imaging in the workup of pleomorphic sarcoma (malignant fibrous histiocytoma) of soft tissue? What is the role of angiography in the workup of pleomorphic sarcoma (malignant fibrous histiocytoma) of soft tissue? Levy AD, Manning MA, Miettinen MM. Soft-Tissue Sarcomas of the Abdomen and Pelvis: Radiologic-Pathologic Features, Part 2-Uncommon Sarcomas. Radiographics. 2017 May-Jun. 37 (3):797-812. [Medline]. [Full Text]. Fletcher CDM, Bridge JA, Hogendoorn P, Mertens F. World Health Organization Classification of Tumours of Soft Tissue and Bone. 4th Edition. Lyon, France: IARC; 2013. Cong Z, Gong J. Primary malignant fibrous histiocytoma of the liver: CT findings in five histopathological proven patients. Abdom Imaging. 2011 Oct. 36(5):552-6. [Medline]. [Guideline] von Mehren M, Randall RL, Benjamin RS, et al. NCCN Clinical Practice Guidelines in Oncology: Soft Tissue Sarcoma, Version 2.2018. National Comprehensive Cancer Network. Available at https://www.nccn.org/professionals/physician_gls/pdf/sarcoma.pdf. March 27, 2018; Accessed: November 1, 2018. [Guideline] Casali PG, Abecassis N, Bauer S, et al, ESMO Guidelines Committee and EURACAN. Soft tissue and visceral sarcomas: ESMO-EURACAN Clinical Practice Guidelines for diagnosis, treatment and follow-up. Ann Oncol. 2018 Oct 1. 29 (Supplement_4):iv51-iv67. [Medline]. [Full Text]. [Guideline] Dangoor A, Seddon B, Gerrand C, Grimer R, Whelan J, Judson I. UK guidelines for the management of soft tissue sarcomas. Clin Sarcoma Res. 2016. 6:20. [Medline]. [Full Text]. [Guideline] Trans-Atlantic RPS Working Group. Management of Recurrent Retroperitoneal Sarcoma (RPS) in the Adult: A Consensus Approach from the Trans-Atlantic RPS Working Group. Ann Surg Oncol. 2016 Oct. 23 (11):3531-3540. [Medline]. [Full Text]. [Guideline] Expert Panel on Musculoskeletal Imaging:., Kransdorf MJ, Murphey MD, Wessell DE, Cassidy RC, Czuczman GJ, et al. ACR Appropriateness Criteria® Soft-Tissue Masses. J Am Coll Radiol. 2018 May. 15 (5S):S189-S197. [Medline]. [Full Text]. Faizi NA, Thulkar S, Sharma R, et al. 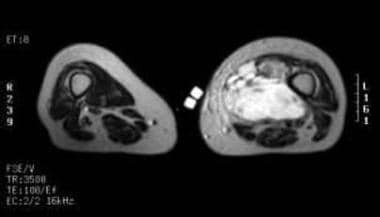 Magnetic resonance imaging and positron emission tomography-computed tomography evaluation of soft tissue sarcoma with surgical and histopathological correlation. Indian J Nucl Med. 2012 Oct. 27(4):213-20. [Medline]. [Full Text]. Amit P, Patro DK, Basu D, Elangovan S, Parathasarathy V. Role of Dynamic MRI and Clinical Assessment in Predicting Histologic Response to Neoadjuvant Chemotherapy in Bone Sarcomas. Am J Clin Oncol. 2013 Feb 5. [Medline]. Tan Y, Xiao EH. Rare hepatic malignant tumors: dynamic CT, MRI, and clinicopathologic features: with analysis of 54 cases and review of the literature. Abdom Imaging. 2013 Jun. 38(3):511-26. [Medline]. Shi F, Zhang F, Gao F, Wu K, Maharjan R, Li C. Refractory malignant fibrous histiocytoma: CT-guided treatment with a multidisciplinary, minimally invasive approach. Technol Cancer Res Treat. 2015 Feb. 14 (1):3-9. [Medline]. Levy AD, Manning MA, Al-Refaie WB, Miettinen MM. Soft-Tissue Sarcomas of the Abdomen and Pelvis: Radiologic-Pathologic Features, Part 1-Common Sarcomas: From the Radiologic Pathology Archives. Radiographics. 2017 Mar-Apr. 37 (2):462-483. [Medline]. [Full Text]. Fang N, Wang YL, Zeng L, Wu ZJ, Cui XJ. Metastatic Malignant Fibrous Histiocytoma in the Stomach: Imaging With 18F-FDG PET/CT. Clin Nucl Med. 2015 Jun 6. [Medline]. Zheng W, Chen J, Liu J, Zuo C, Zhou Z. FDG PET/CT findings of malignant fibrous histiocytoma of the stomach. Clin Nucl Med. 2015 May. 40 (5):413-4. [Medline]. Gok G, Elsayed M, Thind M, Uygur B, Abtahi F, Chahwala JR, et al. Incremental value of live/real time three-dimensional transesophageal echocardiography over the two-dimensional technique in the assessment of primary cardiac malignant fibrous histiocytoma. Echocardiography. 2015 Jul. 32 (7):1164-70. [Medline].